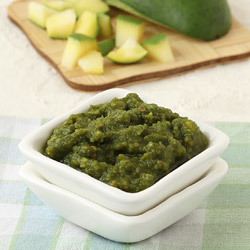 Thai green curry paste is a tempting and tantalizing chilli paste made by mixing green chillies and many other spices. It can be used for making many Thai curries, Thai noodles and Thai soups with meats and vegetables. Master the art of making this paste at home with this recipe. Blend shallot, garlic, lime zest, galangal, lemon grass, thai green chilles, coriander seeds, coriander leaves, cumin powder, white pepper powder and salt together in a blender or food processor. Blend until smooth. Thai green curry paste is ready to be used as ingredient in many scrumptious Thai curry recipes. Follow steps given below to prepare it using mortar and pestle. – Place coriander seeds, cumin powder, white pepper powder, galangal, lime zest, garlic and thai green chillies in a mortar and pound into smooth paste using pestle. Add lemon grass, coriander leaves, shallot and salt it and pound again until smooth coarse paste. You can also use kaffir lime leaves in place of lime zest. Store it in airtight container and store in a refrigerator for up to 2 weeks and use it as and when you need it. Serving Ideas: Apart from being useful in making curries, noodles and soups, it can also be used to tenderize meat and seafood and make them flavorful.